Imagine Apple Inc. as a quintessentially huge machine fuelled by investment, converting labour into value and, via sales, into revenue and profit. John Egan looks beyond the data to what is happening at its core. When Apple filed their latest financial results this month, the company share price soared by more than 6 per cent, taking the market value of the company to over $800 billion. Apple has led the list of most valuable US companies by market capitalisation for the past five years. Anyone who bought $10,000 of Apple shares on 1st January 2001 would today find their investment worth about $1.5 million. Chief-Exec.com has at its disposal a means to explore how Apple has been able to convert investment into value, sales and revenue by considering the company as an energy dissipative enterprise. When this method is used to analyse national economies, the price of a representative product – that exemplifies the entire production of that economy – is seen to correlate with the exchange rate of its currency. 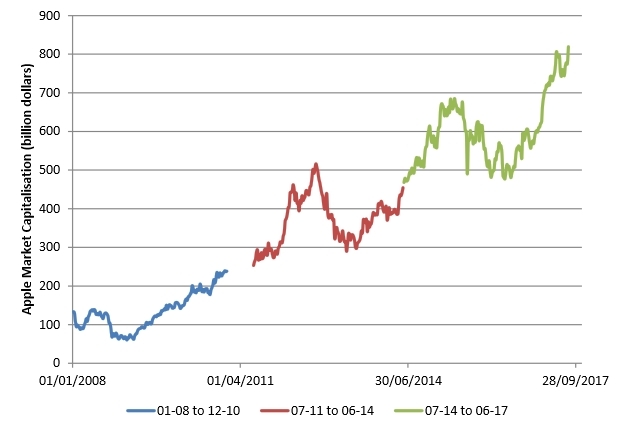 Here we use the same analysis of a representative product to characterise the commercial operations of Apple over three 3-year intervals charted below that span the period from the global financial crisis to the present day. 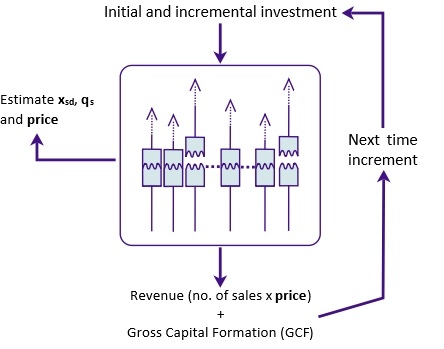 The energy dissipative enterprise is a computer-based simulation of the conversion of investment, which represents an energy input into Apple, into outputs which include the sales revenue and gross capital formation (GCF) of the company. For each interval charted above we have fitted our energy dissipative enterprise simulation to real data from Apple. Input investment data, along with output sales revenue, profits and GCF data has been obtained from the U.S. Securities and Exchange Commission (SEC) database in a time series to cover the years 2008-2017 . The approach follows that described previously for national economies. Enterprise operations are divided into increments with a time interval tr. At each increment the model simulation is matched to the SEC input and output data and the best fit simulation provides estimates of model parameters including the price of the representative product that characterises the commercial operations of the company. An example of this best fit of the enterprise simulation to Apple between 2011 and 2017 is shown below. As was the case with the energy dissipative analysis of national economies, the price estimated for the representative product of companies normally decreases with tr in a proportionate manner that evokes a mechanism comparable to a modified Labour Theory of Value . As with the national analyses we refer to the gradient of this decline, that is the ratio price/tr, as the consumptivity of the company under investigation. We have introduced consumptivity as an alternative to productivity, for which the time in question applies not to the labour of production but to the creation of favourable consumer product interactions and consequent product sales. Essentially, consumptivity is a measure of the value an enterprise is able to create through its commercial operations each day. When capital formation is high, the linear reduction of the price of the representative product with tr breaks down and becomes highly non-linear and unpredictable. In these unusual cases, an adjustment to the consumptivity measure to account for the effects of capital is needed to retain its association with market capitalisation. 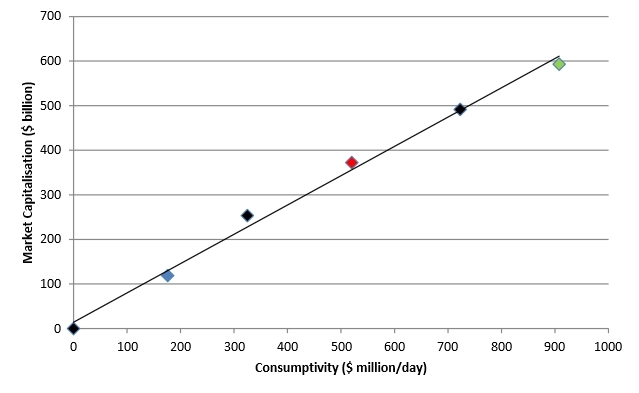 Further details can be found in: Calculation of Consumptivity (pdf download). We have applied this method to estimate the consumptivity for Apple for the three 3-year simulation intervals discussed above. Three additional data points (charted below in black) can be added with simulations that combines the first and second intervals and the second and third intervals, together with a zero activity simulation . For the six data points in which this measure of consumptivity has been generated using the energy dissipative enterprise simulation, there is a close correlation with the average market capitalisation from Apple Inc. over that same interval . The chart below shows that the relationship between company market capitalisation and consumptivity which has been unveiled for Apple is also followed by a host of other companies over the time period 2007 to 2014 . The further discussion and data for this combined chart can be found in: Calculation of Consumptivity (pdf download). There are several important lessons we can draw from the above charts that link the estimated price of the representative product of Apple with the stock market valuation of the company. First, the recent outstanding creation of value displayed in the financial performance of Apple is not extraordinary, but this performance is an exaggerated version of a normal commercial behaviour seen in comparative companies. 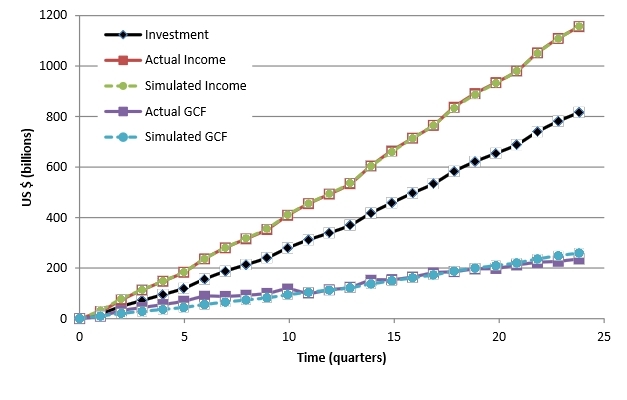 Second, in cases where capital formation (GCF) is modest, consumptivity correlates with earnings. As earnings generally also correlate with market capitalisation, the observed association of consumptivity with capitalisation is not unexpected. This is the regime under which the Labour Theory of Value applies to regulate the commercial valuation of Apple. When capital formation is unusually high, the close association of consumptivity with market capitalisation breaks down as the reduction of the price of the representative product with tr becomes highly non-linear and unpredictable. Third, the findings reported here may not apply in different scenarios. It is possible that the observed link between perceived value of company stock and a factor drawn from real financial performance of companies, namely their consumptivity, may become more tentative over volatile intervals that span the formation of stock market speculative bubbles. GCF is used as a reservoir for conserved energy in the energy dissipative system that represents Apple. This conserved energy for the enterprise thus appears on the consolidated balance sheet of the company. In this case the value that is created by the enterprise operations is the value of Apple stock. In other words, the representative product of Apple is the company stock and the estimated price of this product is correlated to its share price. An alternative but related view of value creation is provided by a representative product that represents the actual products or services of Apple and which is available through an analysis of the company’s operational accounts. Essentially this is the value of the Apple brand and it will be the subject of a subsequent article. It was reported in the Financial Times this week that Apple is in second place in the “Top 100 global brands, 2017”, just behind Google. 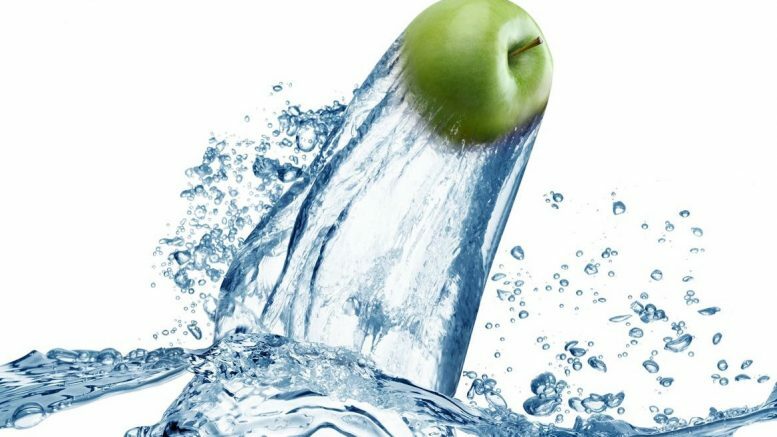 Both brand performance and market capitalisation are visible features of more fundamental phenomena operating within Apple that energy dissipative analysis aims to reveal. The actual data used is interpolated from the SEC data which is filed quarterly by companies. For Apple Inc. the GCF data used is the incremental increase in total assets value as it appears on the condensed consolidated balance sheets of the company (net of property, plant and equipment depreciation). Incremental investment and income data are similarly taken from the condensed consolidated statements of operations. The modification we envisage also considers the endeavours of labour to be formed from two components: innovation that creates the value that is communicated through the consumer product interactions and production that replicates the subsequent sale events across a population of consumers. This is justified as the combining of adjacent time periods produces error surfaces to navigate to the best fit simulation that can be very different from that of their component halves. The zero activity simulation is a logical extension of the model simulation in which zero investment would lead to no value creation or product sales. 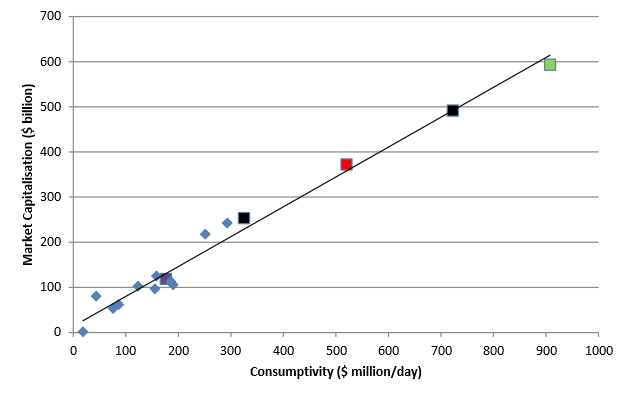 A correlation co-efficient of 0.997 is obtained using a consumptivity measure that is adjusted for a non-zero price intercept, as explained in Calculation of Consumptivity. This adjustment is needed for two intervals in which Apple accounts showed high levels of gross capital formation (Apple 11-14 and Apple 11-17). The correlation co-efficient is 0.986. Additional data is obtained from the financial statements made between 2007 and 2014 by Microsoft, Pepsico, Intel, 3M, Kodak and Amazon.